I guess it's hard to please a perfectionist,but for 40-spots, I think these are pretty terrific shots! Thanks for the compliment, John. I think my family might have a bit of a chuckle at my being called a "perfectionist". I think I'm more of a near enough is good enough type. Having said that, I do try to keep a certain standard with the images. It does tend to make a rod for my own back though, as I reject stories because I don't think the shots are up to scratch. I agree with John, I think they are excellent photos and I'm most impressed. I've been wondering for a while why I don't see 40 spots where I live up on Strickland Ave, backing on to the mountain reserve. We have plenty of Euc. viminalis here, and my husband Meika is sure he's seen a 40 spot once but I haven't! Are there other colonies around Hobart apart from the Peter Murrell Reserve? I haven't heard of any other 'colonies' around Hobart, but there must be the odd vagrant. A few years back, people gathered in Hobart for a National Birds meeting (Birds Australia??) at UTAS happened on a couple in the Uni grounds. I guess you just have to 'fluke' it some times - like Meika's Owlet Nightjar! We're still looking. We now live in Ulverstone, so parhaps we'll find on in the North West. Thanks for the compliment, I do try to maintain a certain standard of photography, but fall short at times. I often wonder whether readers of this and other birding blogs realise the effort required to maintain a blog, especially if they exhibit images.But there again I guess bloggers only have themselves to blame! As John says, 40spots are recorded around the southern Hobart suburbs from time to time, mainly in the non breeding season. All the breeding sites that I can recall are in coastal areas, the next nearest in the Tinderbox area. Keep your fingers crossed, it's just possible you might get a visit by one (or more) one of these days! Now test your Photoshop skills and get rid of that branch sticking out of the bird's throat in the top pic! 40 spots must move around a bit. At Mt Nelson Ken Harris had a few in the 1970s, and then we had them regularly from about 1988-1993 but I don't think they have been seen there by my parents since then. Yes the stick doesn't improve the aesthetics of the shot, but as I've shot better images in the past, and reluctant to "Photoshop" images for the blog, you'll just have to put up with it! I say all that to cover for the fact that my "Photoshopping" skills are not that great. Thanks for commenting. 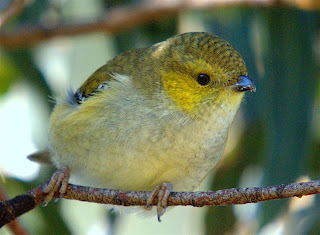 Over the last few years I've become a very keen bird photographer, especially of Tasmanian birds. Having recently 'captured' a Pink Robin (in People's Park, Strahan)I'm now hoping to add the Forty Spotted to my list - I guess it's at the top of that list! Congratulations to the photographer who took these graet photos - although this is now some time down the track, I'll be looking at my chance at Peter Murrell soon. In the last few days I've captuterd some shots of a Dusky Woodswallow feeding its young in a nest: I'd like to add that to a blog, and will - when I sort out how to do it! If it was a positive sighting, is this significant? I had plenty of time to have a really good look as it ccame out of the canopy and stayed quite close and still for a little while. Thank you for your great comments! If you have indeed seen a 40Spot on the Eastern Shore, it would be very noteworthy. I would just mention at this point that in the past there has been some false alarms over there occurrence away from the traditional spots (Peter Murell, Bruny and Maria Islands and a few other sites). 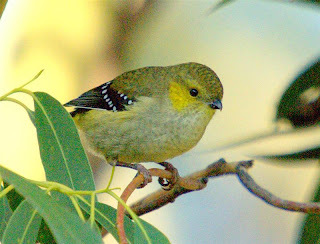 At this time of year there are many Spotted Pardalote youngsters about and they are usually the "culprits". They lack the colouring and have faint spots, and even for experienced birders they can "deceive", especially when they're feeding in the tree canopy. Perhaps with that in mind, you could look again and let the blog know? It would be great to find them here on the Eastern Shore. I must comment again on your fabulous pictures; they are brilliant! I am trying not to harp on about seeing a 40 spot, but the spots on the wing were so amazingly clear; I could almost count them. I immediately looked it up as I had my books with me, so I wasnt really in any doubt as it didnt look anything like the other pardalotes. The spots were only on the wing. I went back today for a couple of hours but could only see/hear spotted pardalotes. I take on board your comments about young spotted ones but the spots on the one I saw were so identical to all pics I have seen. I think I was lucky as lighting was in my favour and it gave me such a clear view. If only I had a camera like yours! 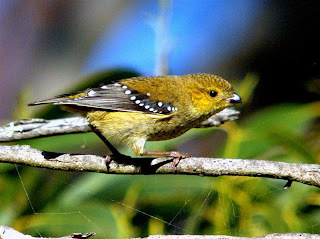 I'm not sure how familiar you are with the Spotted Pardalote, which makes it more difficult to comment on your sighting. 40spots are much harder to notice the spots than the 'spotted' and of course much rarer. Thanks again for your comments, although I'm not sure hat these 40spot images are all I would like them to be! Having a suitable camera is only the beginning and I'm definitely still learning--steep curve.